S. Darko was photographed by Marvin V. Rush, ASC, and takes place 7 years after the tragic death of Donnie Darko. The story follows his youngest sister, Samantha, who has run away from home, unable to deal with the loss of her brother. The old adage of “cameras don’t shoot movies, DPs do” certainly rings true with this movie. Shot with an early build of the Red One camera, Marvin’s masterful cinematography adds credibility to this bizarre ‘sequel’ of a cult classic. For S. Darko, Marvin was working with a constrained budget. This meant that in order to be able to afford such goodies as a techno crane, he needed to make compromises, and this came in the selection of older and cheaper Zeiss Super Speed lenses. Despite having less sophisticated coatings and not being as sharp compared to modern ones, older lenses are finding a new lease of life being paired with new digital cameras. “Resolution is only one aspect of production. If you a photographing a woman then you don’t necessarily want more resolution”, he quips. 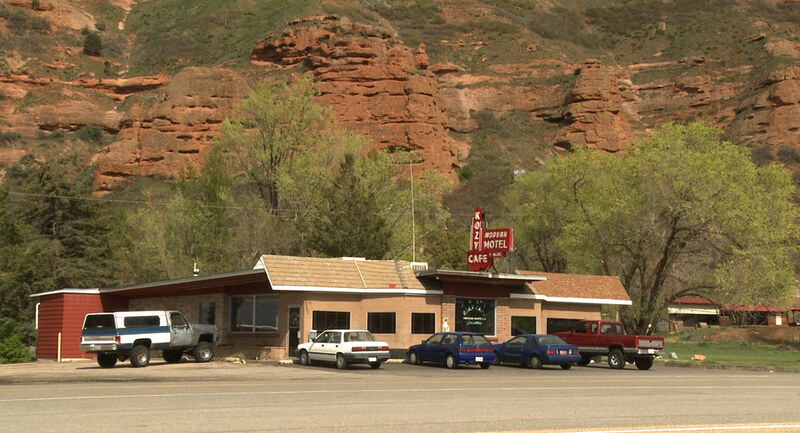 The majority of filming occurred 50 miles west of Salt Lake City, Utah in the late spring of 2008. This is evident in the dramatic mountain ranges and brilliant clouds floating overhead. “Clouds contain a tremendous range of exposure. If you want to capture all of that detail, you have to bring your exposure down and expose for the brightest part of the cloud”, and thus knowing the ‘native’ ASA of the camera is essential. For the Red One Mysterium sensor, almost all DPs I’ve worked with agree on an ASA of 320 for daylight and 200 for tungsten. Understanding the limits of the capture device is essential. “Doing an accurate latitude test is imperative. What are the blackest blacks and the whitest whites”, Marvin asks rhetorically. This is a cinematographer who knows his tools. When the gorgeous images rolled into the DI suite, I was pleasantly surprised by just how much detail there was in the clouds, but not at the expense of the faces. I felt that Marvin had captured the maximum amount of latitude the camera was capable of. This allowed me to to really isolate and saturate the sky while bringing out the clouds at the same time. A separate qualification on the faces was used to lift them out the shadows. Just as you’d expect with a name like S. Darko, this movie has an oxymoron or two: looming mountain ranges frame rusty graveyards and rinky dinky motels in the middle of nowhere. The Production Design team must have had a hell of a time filling every nook and cranny with the million and one chachkas hanging from the walls. When appropriate, I pushed the colours a little further, made the landscapes a little bolder, and turned those cheap motels a little rustier. There’s a fair amount of folklore strewn throughout this tale, and each scene required a slightly different ‘treatment’ in order to bring out the photography. The three images below show such a treatment. In the first picture, the RedLog file has the usual low contrast and desaturated look, but the colour separation and strong shadows are still evident. 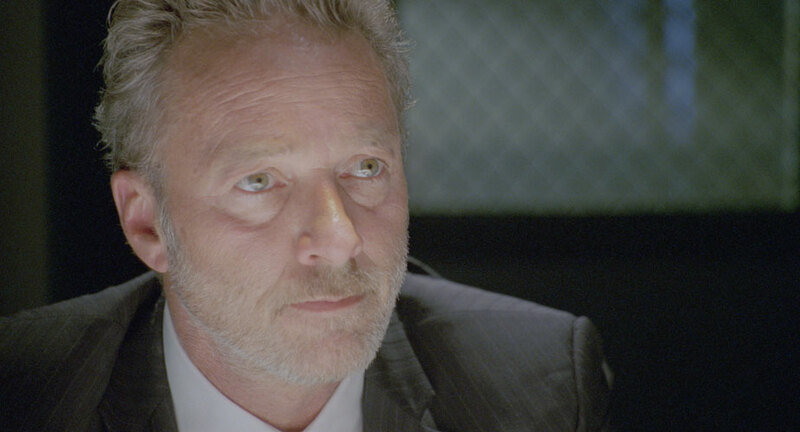 The second picture shows the effects of the LUT and a base grade. Note that the overall temperature of the scene feels cool, and in this instance the RAW file was debayered using 5600K (daylight) and 320ASA. This is how the camera was rated for this scene, and provides a good starting point: the colours feel ‘natural’, with clean blacks/whites and good colour separation. However, this scene takes place much later on in the day, and so I wanted to add a ‘rustier’ tint to it. I did this by adding a good amount of mid brown to the blacks and red to the highlights, but left the mid tones alone; this was to preserve all the subtle blues in the jeans and pamphlets, as well as the greens in the book keeper’s shirt. I finally brought down the shadows and removed some of the red tint from the blacks. In addition to the Red One camera, Marvin used his own Sony EX1 for a very specific reason: time-lapse. The camera’s built-in intervalometer makes up for the fact that it’s a fixed lens camera, producing ‘spectacular’ HD images that cut well with the Red One footage. 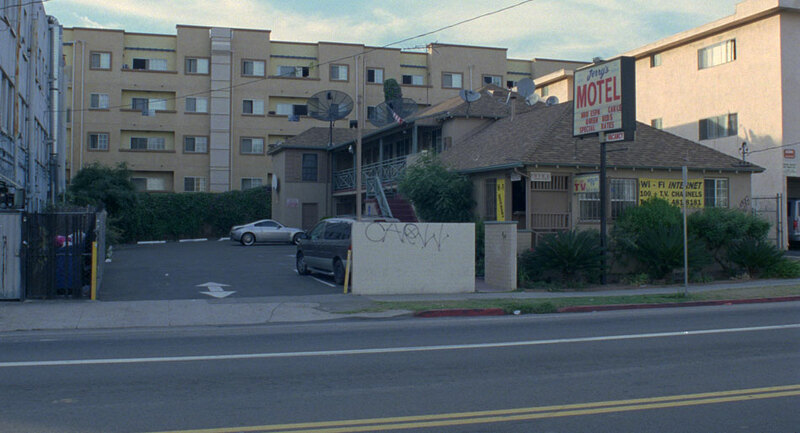 Marvin shot a time-lapse sequence of a motel in the middle of nowhere during the day with the intention of transitioning the shot into a Day-for-Night during the DI. Achieving a good Day-for-Night effect is all about good planning. There are certain steps you need to follow in order to get a convincing result. Usually I start off by bringing down the overall gain and saturation. You can also bring down the lift as well, as long as the blacks don’t get too ‘blocky’. Even though we’re trying to create a night look, we still want to retain the integrity of the image. If you can’t bring down the gain without turning the image into mush then you can pull a luminance key and bring the highlights down by themselves. If I use this approach, I always make sure to use a good amount of softness in the key to avoid any banding. The next step is to start identifying problematic areas: long shadows indicating a setting sun, bright roads, distracting backgrounds (in this case the rock formations) – all of those need to be treated separately, either by qualifying them or by using custom shapes. Many times I tend to actually bring up the gain on foreground objects, while bringing down the lift and overall density to simulate reflecting moonlight. Sometimes, it also helps to use soft grads to effectively ‘burn off’ distracting areas. 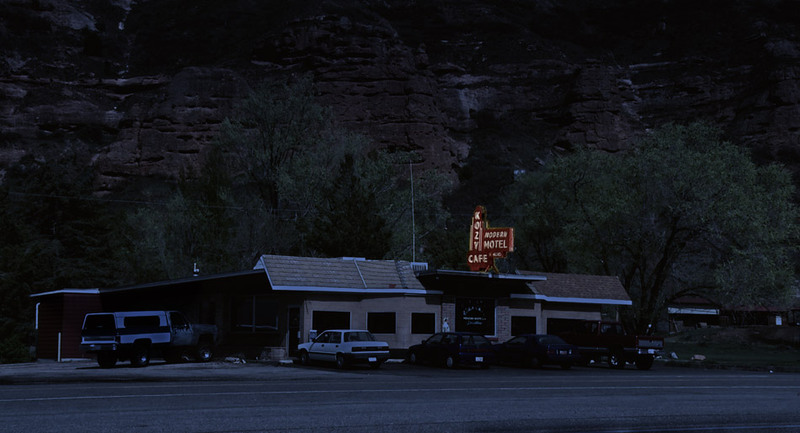 In the example above, I have a separate correction on the road, the motel, the cars, the sign and the rocks, as well as a grad on the top part of the frame. Now with all that sorted, you can finally go in and tint the overall image blue, while further reducing both saturation and gamma. This global adjustment has a unifying effect on all the corrections below it, and is one of the reasons why I wait until this point to tint the image. The other reason is because I want to retain my colour separation as late as possible, retaining the green in the trees, the reds in the sign and the earthen colours of the rocks. 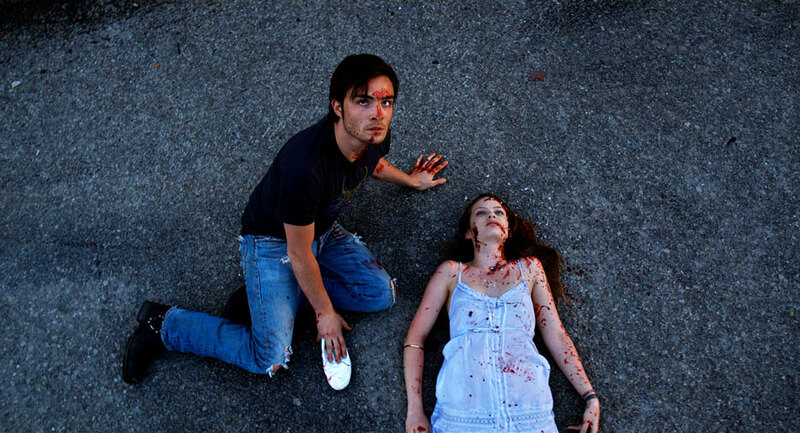 For more S. Darko stills, click here. 2:13 is one of those movies that can be hard to watch at times. The easiest way to describe it is Se7en meets Saw, with a visual style to match. It’s no coincidence that the Cinematographer is none other than David Armstrong, ASC, creator of the Saw look and one of the most successful franchises in recent years. 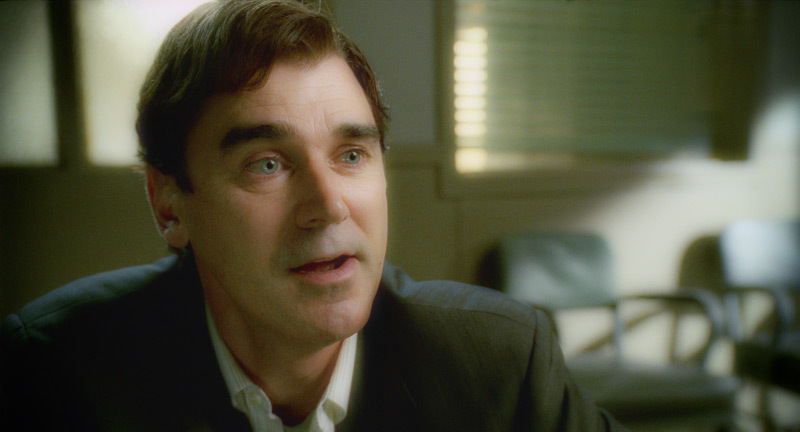 The Film Director, Charles Adelman, was the client for this job. Charles was clear about his intentions: he wanted Hicon, ‘gutsy’ images for all of the violent scenes to contrast with the more toned down investigation parts. Then there were the scenes that needed special attention: flashbacks feature regularly in this movie, and he wanted those to feel dreamy yet ‘creepy’. 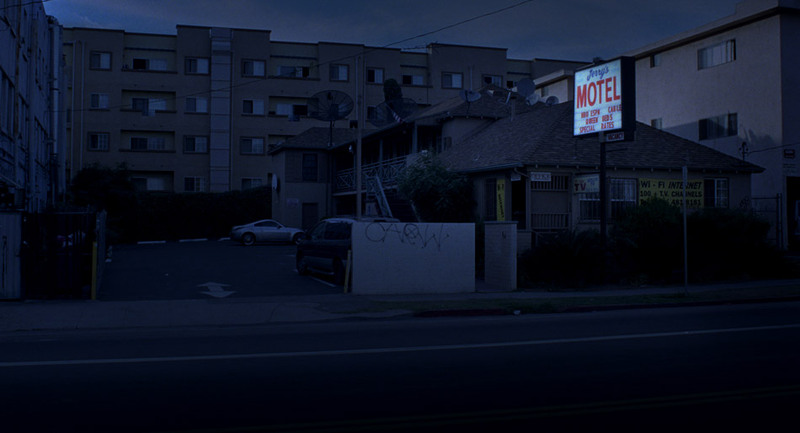 There was a day for night motel shot in broad daylight that was a challenge, and the final interrogation scene had to feel cold and ominous. I’m not a colour purist in the sense that I’ll use whatever tool is right for the look that I’m trying to achieve. For the dream sequences I wanted something special. One of my favorite FX plugins is called Tinderbox DiffusionFilter, and I’ve often used it to soften the harsh lines you sometimes get when CG is composited over live action. However, you can also use the numerous plugin controls to define edge thresholds, and subsequently ‘bloom’ those edges to create some very interesting glow effects. This technique creates a different look to the usual approach of blurring the highlights and raising the gain, and pushes the effect into the entire image versus just the highlights. It also doesn’t blow out the highlights. For the final interrogation scene, Charles wanted a very cool, steely look reminiscent of T2. There wasn’t a hint of coolness in the negative as can be seen from the image below, so I had to push the image quite hard to get it where it needed to be. I started off by adjusting the contrast through my print emulation LUT and working with some HSL curves to move the tones towards a cooler palette. Curves allow you to use a broader brush and thus work more organically, avoiding edge issues that can be a problem when using keys to qualify regions of colour. 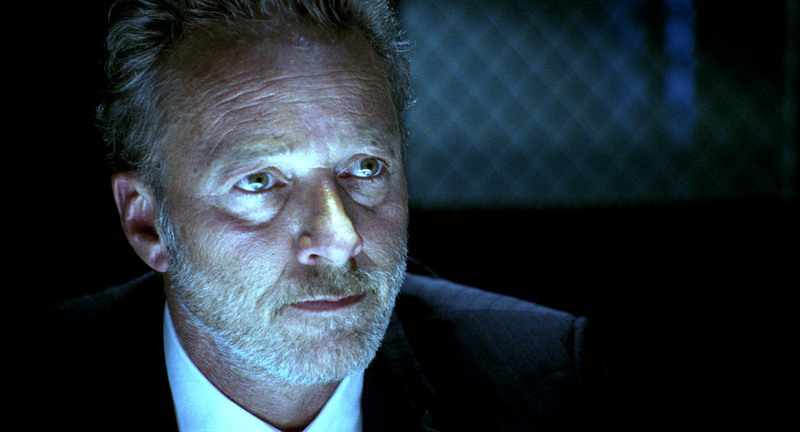 Then I moved onto finessing; inky blacks, silvery highlights with a cool tint, strong vignetting to make Spivey look like he’s emerging from the blackness of the interrogation room. One thing you want to be careful of when creating a cool look is that your skin tones don’t go completely blue, unless you’re working on the sequel to Avatar! Instead, I brought back some of the original skin tones and blended it with the underlying cool image. I snapped the contrast and let some highlights burn off to simulate the harsh lighting of the room and was finally done! …And after 8 layers of colour! As much as I love the immediacy of digital acquired images, there is still a lot to be said about the texture of film and its enormous latitude. You can push the negative in all sorts of weird and wonderful ways and it will always perform: the blacks wont block up and the highlights will rolloff nicely instead of clipping hard. That’s film. This is clearly evident in the day for night image below. The images below show the transformation from a mid afternoon shot to a 4am setup. First, we start off with the Raw Log image. After the print emulation LUT is applied, I do an overall treatment: I bring down the blacks a little, the gamma more and the highlights more still. This is to reduce the overall brightness and contrast of the shot. I then bring the saturation down and add blue to the entire image using printer lights. On a log image, this amounts to an equal distribution of blue across the image. The second image shows us where we are at this point. Even though there is a big difference, the image is flat and not very convincing. Then I move into specifics. I usually qualify the highlights, bring down the gamma a little but pull up the gain. This helps retain contrast in the bright areas as you bring them down, otherwise the image can start to get muddy. The background buildings are isolated from the rest of the image using carefully placed roto-splines, while the actual motel is given a contrast treatment to separate it from the buildings behind it. Graduated masks are used to pull down the road and the buildings on the right, and then the left side of the sky is brought up a little bit to simulate fading moonlight. Finally, the windows are brought up a little bit and tinted blue to accentuate the moonlight spill. So far so good, but to really sell the shot, I composited the processed image over the raw image, keyed through the highlights using an HSL keyer to expose the original sign, applied a Sapphire Glow to it and then pulled out a bit of blue while saturating the reds in the neon sign. Done! For a broader selection of stills from this film, click here. 2:13 was colour timed at Steele VFX in Santa Monica.